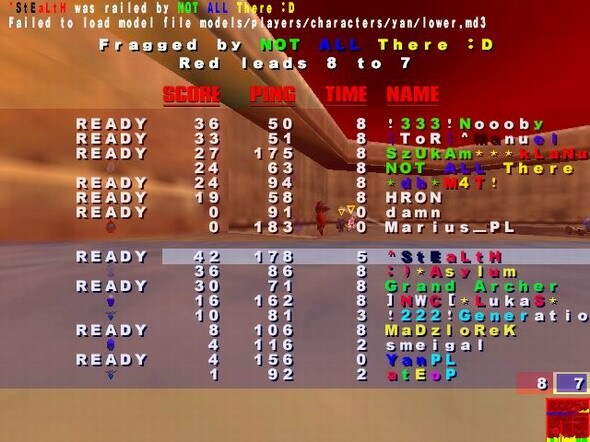 great score and great ping for pizzatag (aka stealth)! Posted on 14 March 2005 at 14:04:50 by GinG. um i thought only nicks which are ur own should be posted and are shown ? Posted on 15 March 2005 at 19:29:14 by Anonym. Posted on 24 March 2005 at 05:52:01 by p0isoN. and i have many screens with *Lyor , thats my 3. nick after 333*Nights . can i post it with aka poison :P ? Posted on 29 November 2006 at 17:22:46 by sve. Posted on 24 January 2007 at 20:41:38 by adam*pl. Posted on 14 November 2017 at 20:27:36 by Anonym. Posted on 27 November 2017 at 10:50:36 by Anonym. Posted on 29 December 2017 at 08:16:43 by Anonym. Posted on 07 January 2018 at 07:55:07 by Anonym. Posted on 12 March 2018 at 06:38:56 by Anonym. Posted on 11 April 2018 at 10:44:20 by Anonym. Posted on 23 April 2018 at 09:09:19 by Anonym. Posted on 05 July 2018 at 05:26:44 by Anonym. Posted on 16 July 2018 at 04:14:06 by Anonym. Posted on 25 July 2018 at 04:47:57 by Anonym. Posted on 10 August 2018 at 10:19:49 by Anonym. Posted on 22 August 2018 at 08:57:35 by Anonym. Posted on 29 September 2018 at 08:05:06 by Anonym. Page processed in: 0.8047 seconds.